Micro markets are the latest trend in vending. There are many benefits of micro markets, and countless reasons to install a micro market in your business. However, we know a big question you might ask is “is a micro market right for my company?” Business size and current vending solutions aside, here are three main reasons a micro market is right for you. Time and time again we hear about how pleased users of micro markets are. They love the options, the prices, the ease of use, and the access. If you’re looking for a way to ramp up employee satisfaction and show your commitment to your team, a micro market is your answer. Micro markets allow your employees to purchase items at their will in a convenience store-like setting without ever having to leave your building. 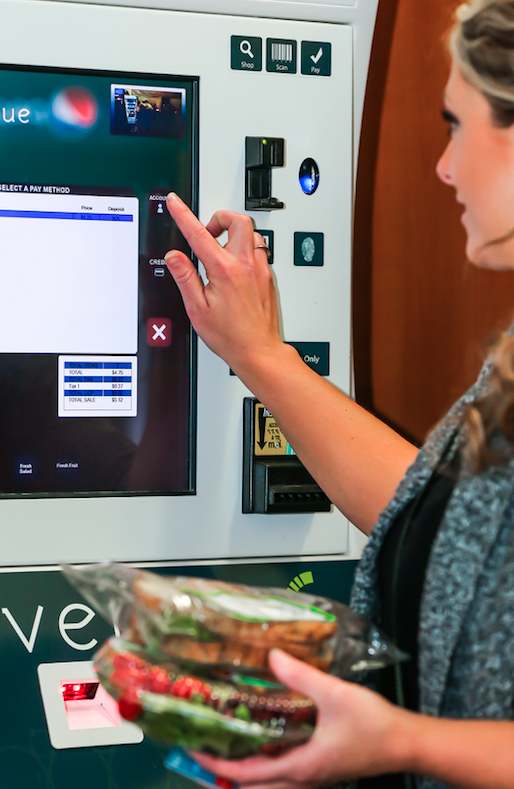 Different than traditional vending machines, micro markets allow individuals to pick up, feel, and examine each item before they purchase it. Micro markets are conducive to a different level of efficiency with the option for employees to purchase multiple items at once. On the topic of purchasing, users never have to worry about carrying cash or change with them. Many micro markets are set up with a thumbprint payment system, account numbers, or by credit card. Payment is self-checkout style, which makes it fast and easy for your employees. Micro markets help you focus in on the needs and preferences of your employees and offer them a wider variety of items including “better for you” products – specifically more in-season fresh fruits, veggies, and beverages. Because micro markets are not limited by a specific layout, design, or product lists, the opportunities are nearly endless. Micro markets are an extremely modern concept for workplace campuses. They allow the convenience of a mini-mart without the cost or hassle of monitoring products. Because you have fewer machines and advanced technology, the overall purchasing and user process is simplified with a micro market. Each staff manages their own micro market account they can use at any time to purchase things from morning coffee, to an in-season salad and fruit at lunch, to the afternoon beverage and snack fix. Whether they want to use cash, card, or an account password they can get what they want, when they want it. There’s no hassle for you or your company. Items in micro markets can be stocked in various amounts, depending on demand and preference of your staff and employees. You don’t have to worry about limited space in machines or catering to various preferences – a micro market can simplify it all by offering a bigger, better variety. Micro markets also simplify workday routines for employees, too. They can make healthy, fresh, reasonably priced purchases without having to leave the building, be late for a meeting, or worry about wasting time. Allowing food and beverage options for your employees to exist on work premises is safer, easier, and more productive. When businesses decide to implement a micro market, mistakenly think they are about to make a big financial investment. Although a micro market makes a big investment for employees, it involves no financial investment from the company’s perspective. With Bernick’s as your partner, your micro market is essentially free. We install and maintain micro markets at absolutely no cost to you or your business. This includes delivery of items, any necessary repairs, various service improvements, and even the security cameras for your micro market space. It’s truly a hassle-free, all-in-one set up. Micro markets are incredibly easy to install and run. There is no purchasing or leasing on your end – just a great option for your employees and staff. It’s not too good to be true. If you’re inspired to simplify your business and satisfy employees on a whole new level at no cost to you, get in touch with one of our Micro Market Specialists and get this exciting process started!